I am late again, I've been busy updating my website this week so haven't had a lot of time for crafts. I have also been helping my daughter revise for her exam to get into college in September. She had the exam on Wednesday and was able to get the results straight away. She got 100% which is a distinction and she only needed a pass to get on the course. I have finished my papel picado experiment and I'm quite pleased with the results.Which you can see in the pic, I have made some bunting which is now decorating the craft room. This is quite hard work so I really admire the traditional Mexican crafters that do this all the time. I will be putting the instructions up on my website within the next couple of days. I'm off now to visit Wendy's Blog at 1st Unique Gifts to see what everyone else has posted forHandmade Monday. Well done to your daughter - and well done to you too, that bunting looks amazing! Thanks for all your lovely comments. I'm particuarly proud of my daughter as I took her out of school 3 years ago and homeschooled her. She was getting into so much trouble at school that they had written her off. 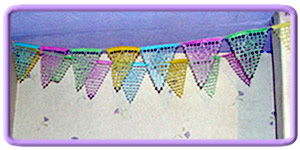 The bunting is made from tissue paper in the traditional Mexican way. They cut up to 50 sheets of tissue paper at a time using a hammer and chisel, I only did 24 and that was tricky enough. Your bunting is amazing. I thought the triangles were crochet!!!!. Love to see a tutorial for this. Well done to your daugther and you for schooling her. Hugs Mrs A. The bunting looks amazing, lovely colours and sounds so complicated. Many congratulations to your daughter, you must be so proud. The bunting looks so delicate, cannot imagine what it feels like to chisel through so much paper but the results are delightful. Beautiful papel picado ... must admit this is totally new to me and looks amazing! Bunting is just great! I'm so pleased you posted your papel picado straight away, I was really looking forward to it. It looks fantastic. Home schooling has pros and cons, and it sounds like you managed to get all the pros from it, well done. Thanks for all your lovely comments they really are appreciated. The tutorial pages are now up on my website. You can find the first page Here. I hope you like them and find them easy to follow. If you have a go do let me know. 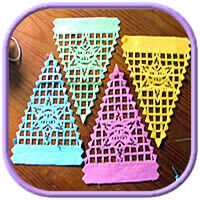 Fabulous bunting!It looks so beautiful hanging on your wall! 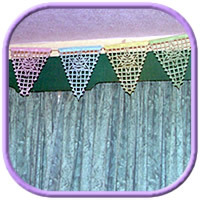 this lacey bunting is so fun! definitely stands out among other bunting designs :) well-done!